We’re getting more great entries in our 2014 Harvest Photo Contest. This one is from Annmarie Mones in Trumbull, CT. Here in CT I used the square-foot gardening method. I had several different patches and varieties of carrots, beets, and some parsnips planted this year. Unfortunately, voles moved into my garden, and I lost all my beets and some of the carrots and parsnips. I decided to pull almost all the root vegetables to see what I could salvage. I am happy to say I have carrots to last me awhile! 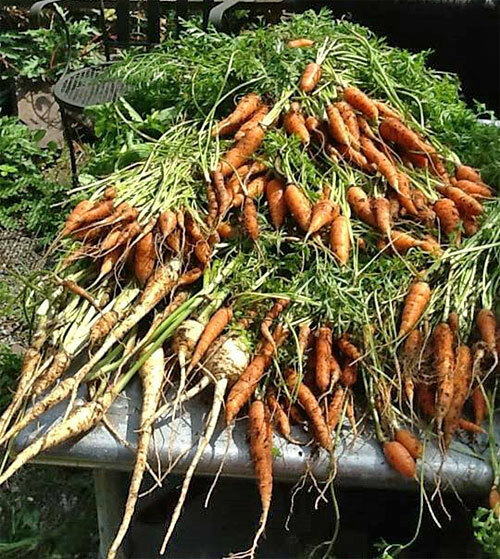 This pile of carrots are all keepers and waiting for me to clean them, along with a few parsnips. Have a great photo of your harvest? Enter the 2014 Harvest Photo Contest.